This past week Rand and I had the best time making cupcakes and icing. He had been on me all week about cooking (it is one of our fave pastimes together). 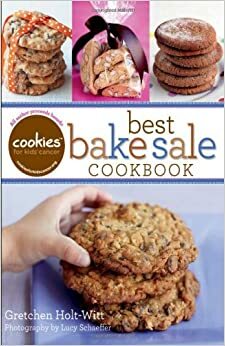 I took out the Best Bake Sale Cookbook by Gretchen Holt-Witt and we got down to baking. I was given this book as a gift by my friend Hilary, who is also the Alumnae Director at Meredith College. The author and mother, Gretchen Holt-Witt is a Meredith College Alumna. When Hilary handed it to me a few years ago she began to tell me Gretchen’s now famous story. Her son had cancer and she made a goal to sell cookies to raise money for pediatric cancer research. Her bake sale and subsequent cookie sales were so successful, ” Gretchen and her husband Larry answered the call to action by starting Cookies for Kids’ Cancer (cookiesforkidscancer.org), a national non-profit that inspires people to host bake sales of all sizes, from desktops and porches to entire corporations and communities, with some raising more than $30,000 in one day. …100% of the author’s proceeds and royalties will be donated to Cookies for Kids’ Cancer for pediatric cancer research.” This is just another great reminder of how lucky we can be to have healthy children. Rand loves vanilla anything so we decided on making the “your basic, but fabulously rich, golden yellow cupcake” We had so much fun baking together. She recommended making a chocolate ganache topping but we didn’t have all the ingredients so instead I made her “seven-minute frosting” it was great but it took me about fifteen minutes. I’m not the best baker so I’m sure that is why. Here I am whisking the frosting, you have to whisk for seven minutes… I guess I was a little too slow. Side note … we only had Christmas Sprinkles. It didn’t bother him so it didn’t bother me! This book is sprinkled with inspirational stories that I sat down and read while I was waiting for the cupcakes to cool. It reminds you that the tenacity of a mother can accomplish anything. I’m so inspired by people who see a problem, and are determined to make a difference. If you haven’t read/bought this book go do it!! and hug your kids a little longer today… healthy kids are the biggest gift of all.